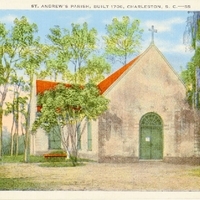 A postcard depicting Old St. Andrew's Episcopal Church in Charleston, South Carolina, a colonial cruciform church. It is the oldest church south of Virginia that is still used for worship. Originally published by Martschink Sales Company. "A BRIEF HISTORY OF SAINT ANDREW'S PARISH CHURCH." Old St. Andrew's Parish Church. http://www.oldstandrews.org/welcome/history.htm. “St. Andrew's Parish Postcard.” RICHES of Central Florida accessed April 18, 2019, https://richesmi.cah.ucf.edu/omeka/items/show/6744.